I know a Subaru review that focuses on all-wheel-drive is cliché, but in my case, if I hadn’t been driving a car fitted with the system on my drive back from Ottawa to Montreal during one of the most intense winter blizzards the province of Quebec has witnessed this year, I could very well not have written this story. Truth be told, Subaru has one of the best AWD systems in the business, but I’ll get back to that later. What I want to talk about is how underrated the little Impreza is in this oversaturated world of excellent compacts. Like Clark Kent that attempts to fit amongst the common folk, Subaru’s entry-level car can achieve things other compacts can’t. But it doesn’t flaunt it. It goes about its business wearing an unassuming suit. And there lies its charm. I have once said that Subarus don’t really change, but simply evolve into a new skin. The 2018 Impreza is a case in point; apparently Subaru has completely restyled it from head to toe. But you’d hardly notice it. Ok, fine, it’s got those cool new LED headlights now. At this point, I think it’s fair to say that the Impreza isn’t what most would qualify as a good-looking automobile. In this Sport-tech trim, it does boast a set of cool 18-inch running shoes and a rear deck spoiler, but apart from that, there’s nothing particularly exciting about the way this compact looks. What counts is what you’re getting underneath the sheetmetal, a recipe so good that its basic ingredients have been virtually unchanged for over two decades, and not because Subaru is unable to change it, but because it doesn’t need to. As always, under the Impreza’s hood lies a Boxer-type four-cylinder engine, or more commonly known as a flat four. Still rated at 2.0 litres of displacement, the mill was given direct injection last year, resulting in a slight bump in horsepower – 152 horsepower versus 148, and improved fuel economy (7.8 L/100 km combined). Torque remains unchanged at 145 lb.-ft. My tester was fitted with a continuously variable automatic (CVT); however, fans of the stick will be pleased to learn that a five-speed manual is still available in some of the Impreza’s lower trim levels. Sadly, a well-equipped Sport-tech such as my tester only comes with the automatic. Also, the manual cars do not, for some reason, come with the Crosstrek’s all-new six-speed unit. Speaking of Crosstrek, back when I had reviewed it, I had claimed it was essentially a lifted Impreza with body cladding. You can imagine that I was pleased to get behind the wheel of the car on which it’s based to test out my theory. It’s true. The Crosstrek and the Impreza feel nearly identical behind the wheel. It also makes you wonder if one actually needs a crossover. I ask, because cargo space in an Impreza hatchback is ample, more so even than in some subcompact crossovers currently available. There’s 1557 litres of available space back there with the seats folded down. That’s more than in both a Chevrolet Trax (1359 litres) and a Kia Soul (1415 litres). Then there’s the really fun stuff. Not only is the Impreza one of the only compact cars to come with four driven wheels, contrary to its only competitor, the Volkswagen Golf SportWagen 4MOTION, all-wheel drive is a standard feature. Even on the $20,895 ($19,995 for the sedan) bargain basement Convenience trim level, freight and delivery charges excluded, you get it for free. 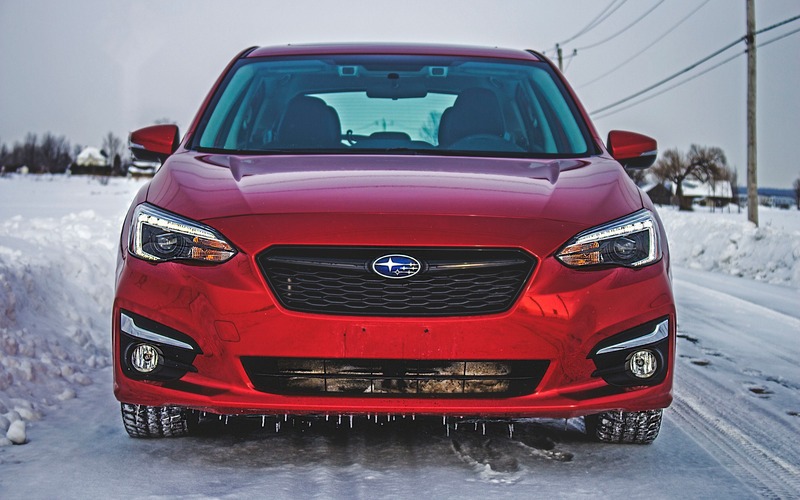 There are a lot of great systems out there, but none of them offer the planted, secure feeling of Subaru’s symmetrical all-wheel-drive. What’s the secret, you ask? First, the engine. Remember how I mentioned how it’s a flat four? Well, that allows it to be positioned low in the engine bay, significantly reducing the car’s centre of gravity. The AWD system itself is preventive, not reactive like Volkswagen’s 4MOTION or the one found in a Honda CR-V, for instance. This means it’s not a front-wheel-drive system that kicks into four wheels when it detects slippage. Subaru’s system is always on. Cram it all that into a small, lightweight compact hatch or sedan that doesn’t weigh all that much more than a Honda Civic, and you end up with a tremendously capable little machine. On my drive back from Ottawa in the storm, I was able to engage passing manoeuvres over thick snow, gutsy wind and icy pavement patches no sweat, remaining nice and stable the entire time. Another endearing trait of the Impreza is its nimble, taught chassis, entirely reworked for 2018 thanks to Subaru’s all-new Global Platform architecture. 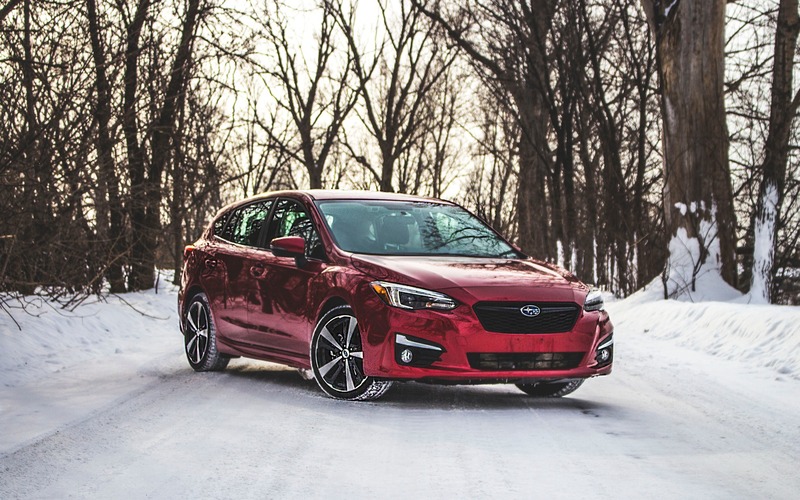 The Impreza is fun to drive, engaging thanks to a light, communicative steering, and its improved suspension compliance. This is one of the best balances of refinement and driving dynamics I’ve come across in a small car. The cabin itself is also rather pleasant to spend some time in. 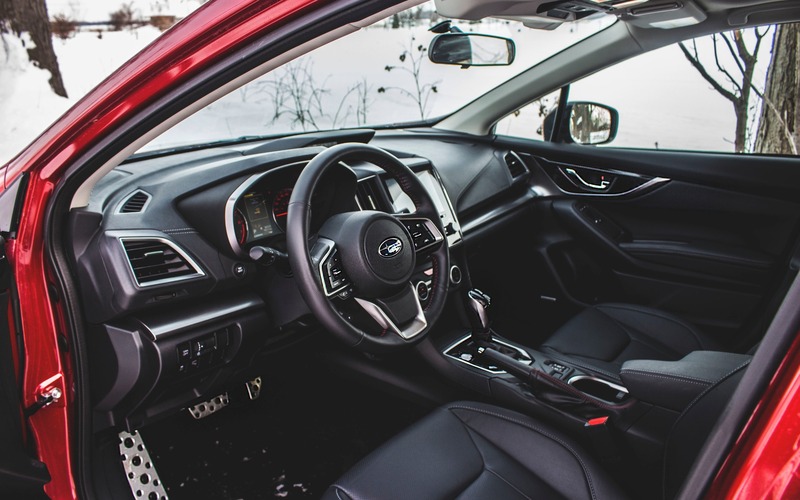 Like the Crosstrek, the Impreza’s interior was entirely overhauled with new materials such as faux carbon fibre and piano black plastics. It looks good in there, nice and airy, modern, young and well put together. My only caveat with the Impreza’s cabin is that it’s loud in there. Although Subaru says it significantly improved noise deadening, tire roll, wind noise and the – ahem – buzzy Boxer engine remain very present. The rear bench is spacious for adults, the front seats are as well, but the leather upholstery my tester was fitted with is hard and not all too comfortable. Subaru’s Starlink infotainment system remains excellent with its large colourful icons, redundant physical controls and Apple CarPlay / Android Auto connectivity. All in all, the 2018 Subaru Impreza is an accomplished compact car. Sure, it’s not what you would call peppy off the line, and its styling is all but exciting. There are arguably better-looking small cars out there. But in hatchback form, the car will engulf a lot of gear, and during the winter months, it’ll get to places a Honda Civic would only dream of seeing with its own eyes. With a price tag that isn’t all that much higher than a well-equipped Corolla, the Subaru Impreza is a superhero that’s simply trying to fit in disguised as a humble people mover. 8/10	We managed a 7.8 L/100 km average, in winter. For an all-wheel-drive car, that's excellent. 6/10	The cabin itself is roomy and so is the rear bench, but those sport front leather seats are hard and don't offer much support. 4/10	The Impreza isn't a quick car, no matter which transmission you choose. 8/10	Tight, nimble chassis, precise steering, and light on its feet. Very fun to drive! 8/10	A humble, affordable and well-put-together compact car that will outperform any or its rivals on slippery surfaces.